18 Example 4: A Useful Exercise. 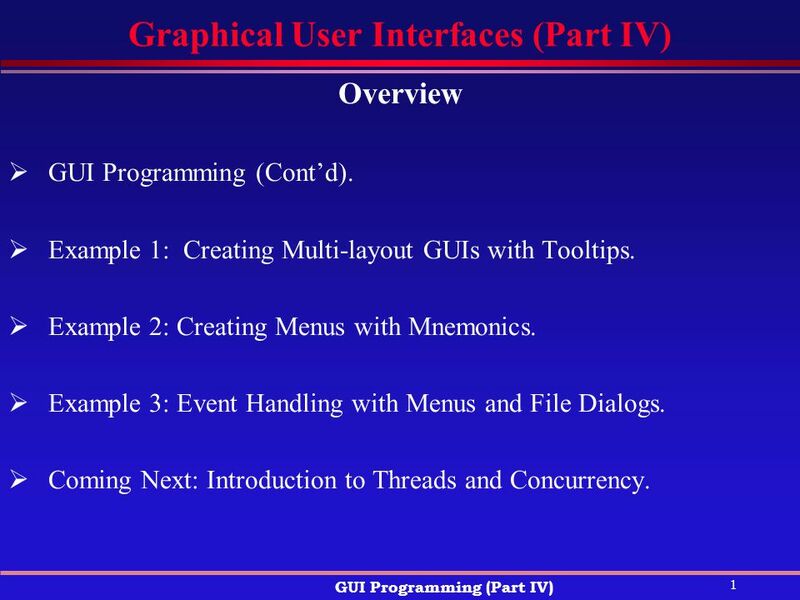 Download ppt "Graphical User Interfaces (Part IV)"
1 Graphical User Interface (GUI) Applications Abstract Windowing Toolkit (AWT) Events Handling Applets. 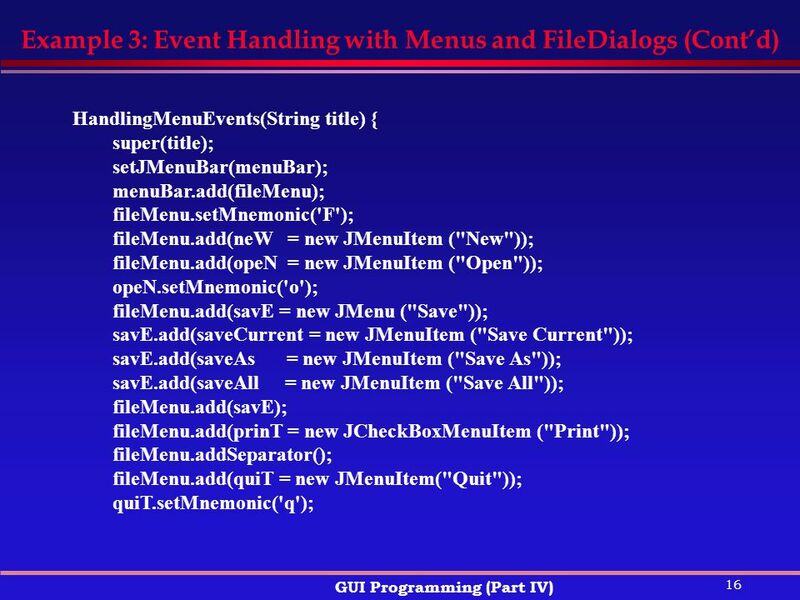 Chapter 16 GUI Programming Basics GUI Overview Event-Driven Programming Basics GUI Classes and Packages A Simple Window Program JFrame Class Java Components. 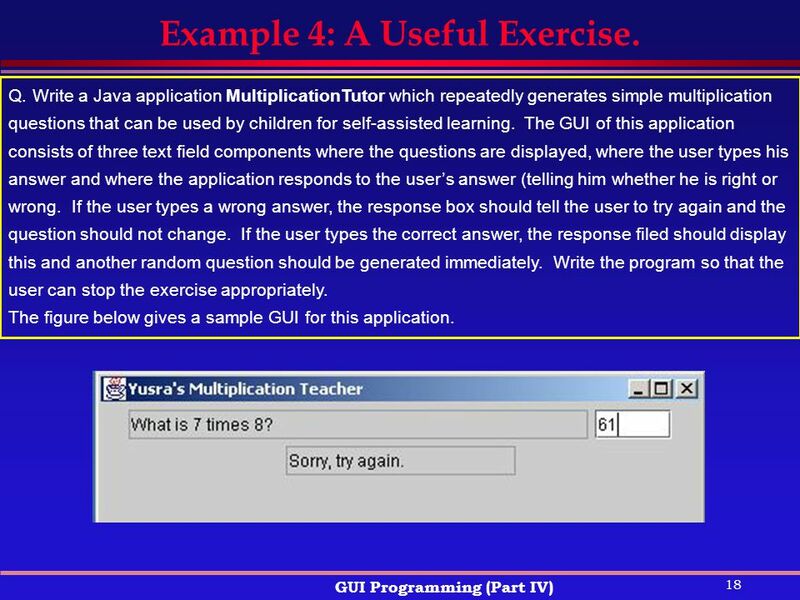 Java GUI building with the AWT. AWT (Abstract Window Toolkit) Present in all Java implementations Described in (almost) every Java textbook Adequate for. Introduction to Swing Components Chapter 14. 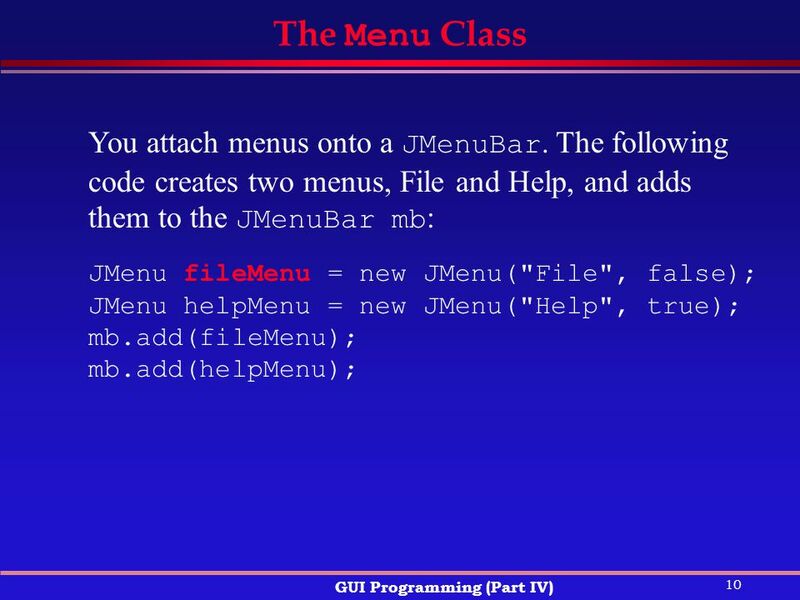 Part of the Java Foundation Classes (JFC) Provides a rich set of GUI components Used to create a Java program. 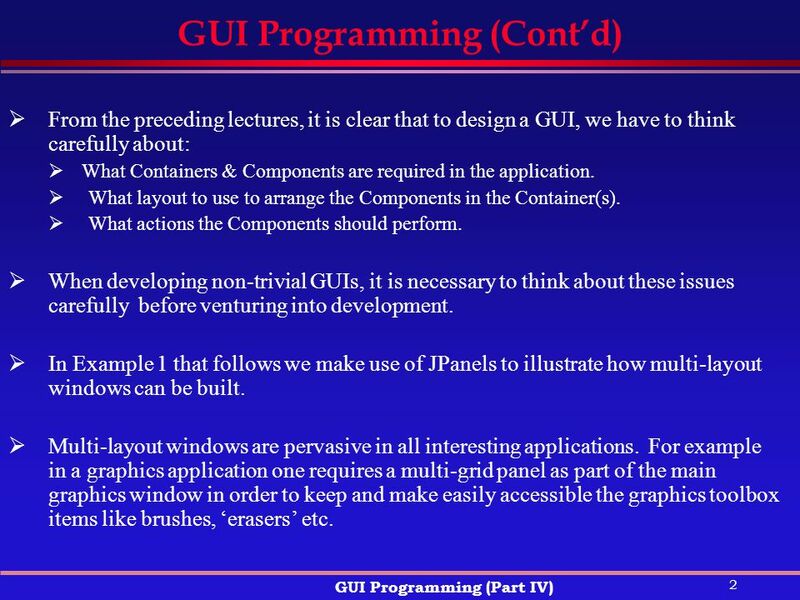 Unit 121 A layout manager is an object that determines the manner in which components are arranged in a container. Each layout manager implements one of. 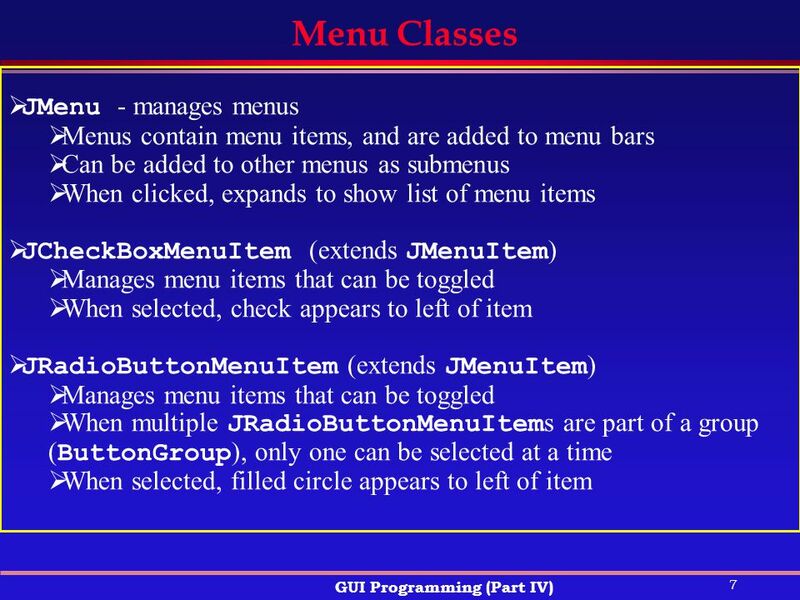 1 cs205: engineering software university of virginia fall 2006 Wimpy Interfaces. 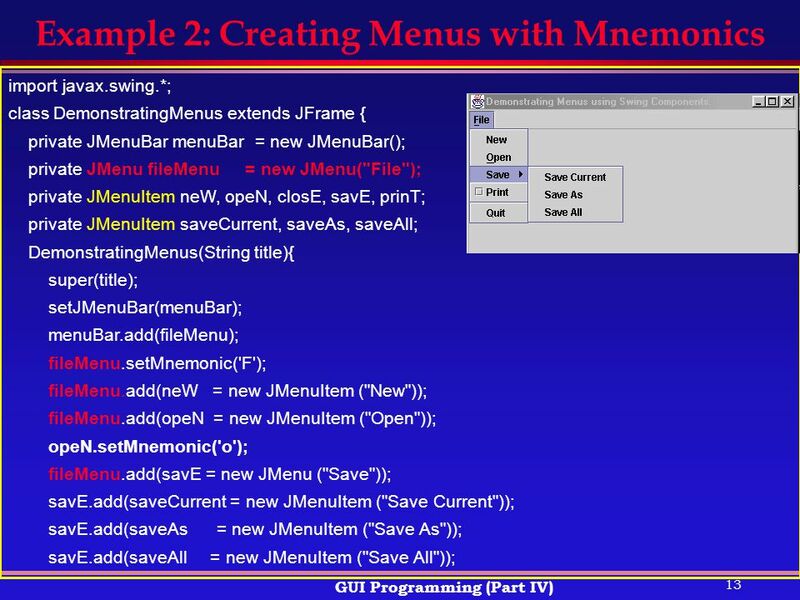 Chapter 11 Creating User Interfaces F What is JavaBean? 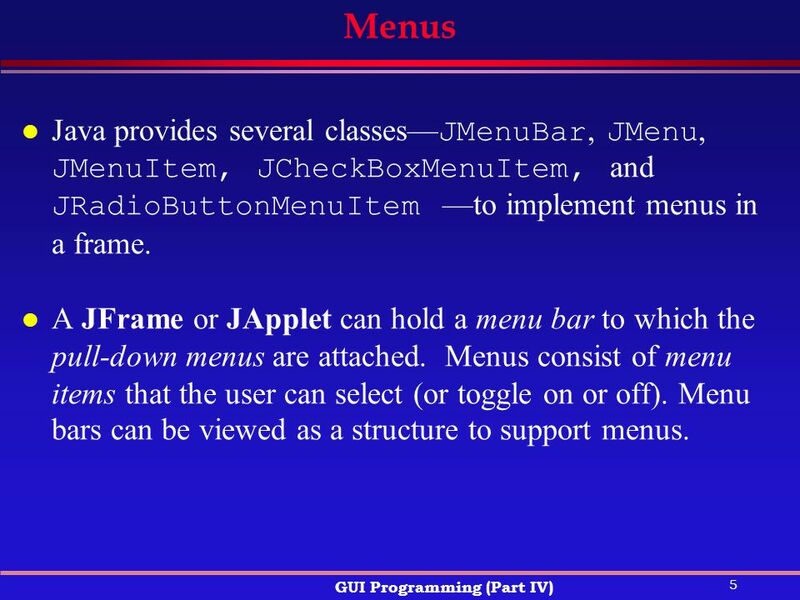 F JComponent F JButton  ImageIcon  JLabel  JTextField  JTextArea  JComboBox  JList  JCheckBox. 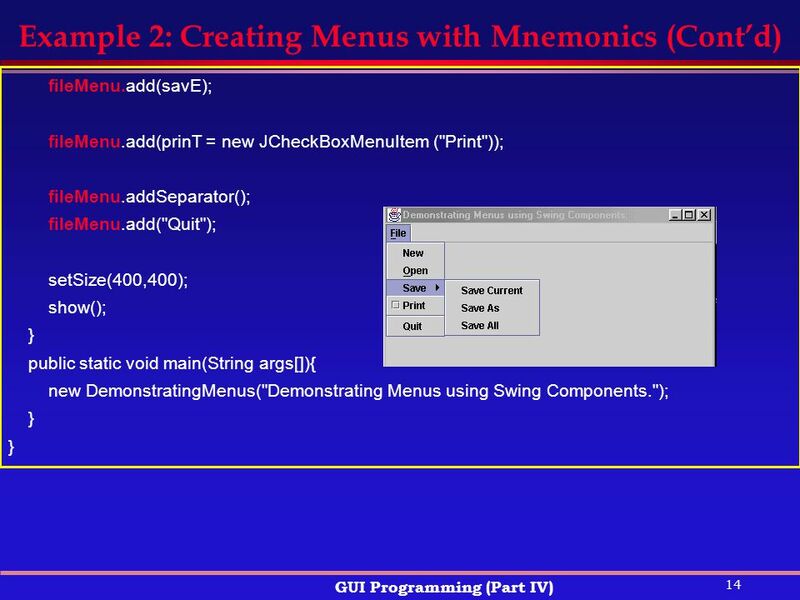 Graphical User Interfaces Java’s AWT and Swing APIs. 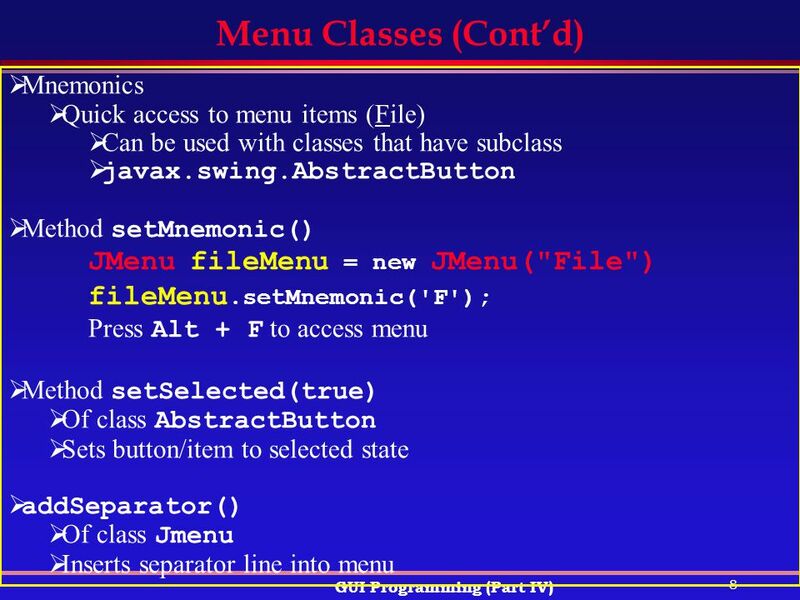 Java Software Development Paradigm Lecture # 12. 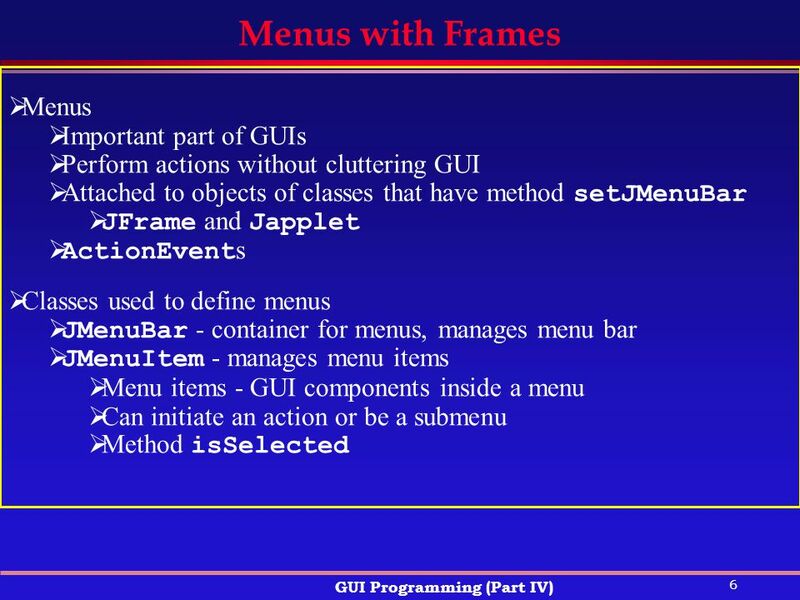 Basics of GUI. Examples. 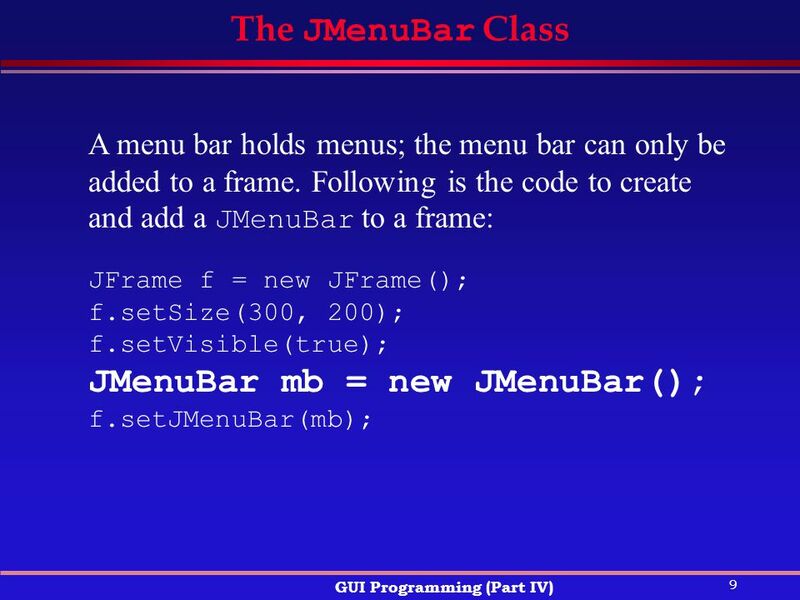 // A simple Frame with Rectangle Inside import java.awt. 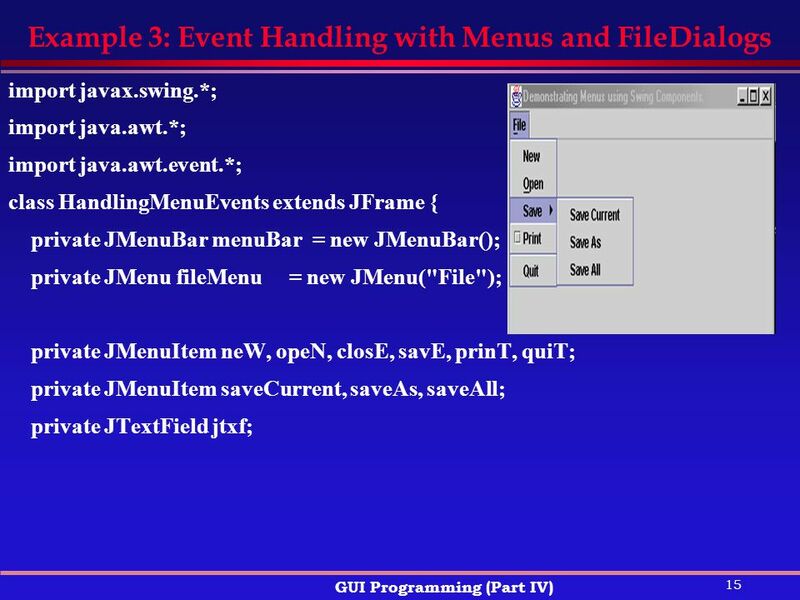 *; import javax.swing. 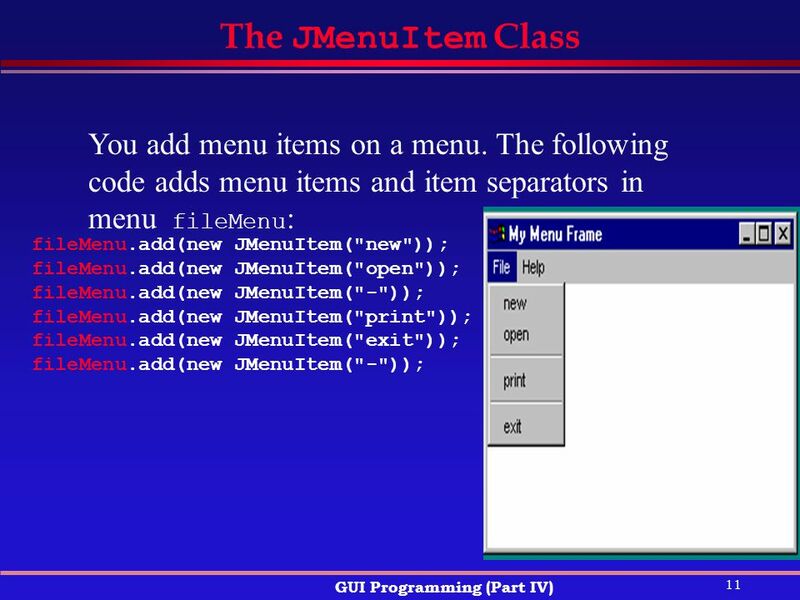 *; import java.awt.geom. *; // For Shapes class rectComponent extends. 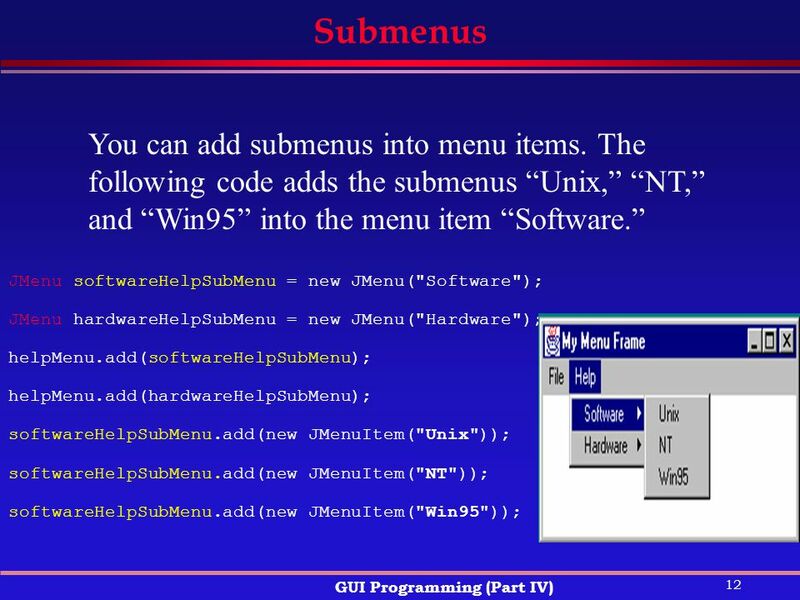 CS18000: Problem Solving and Object-Oriented Programming. 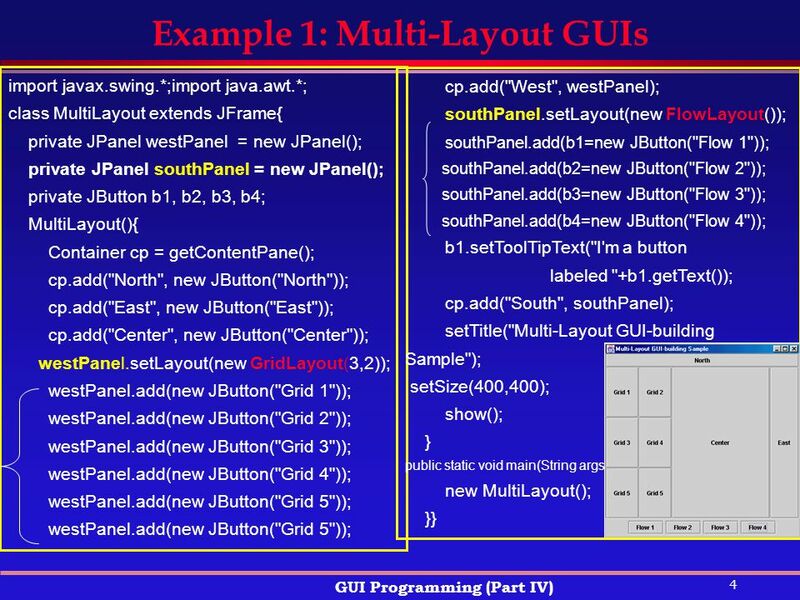 Unit 3 Graphical User Interface (GUI) Dr. Magdi AMER. Graphic User Interfaces Layout Managers Event Handling. 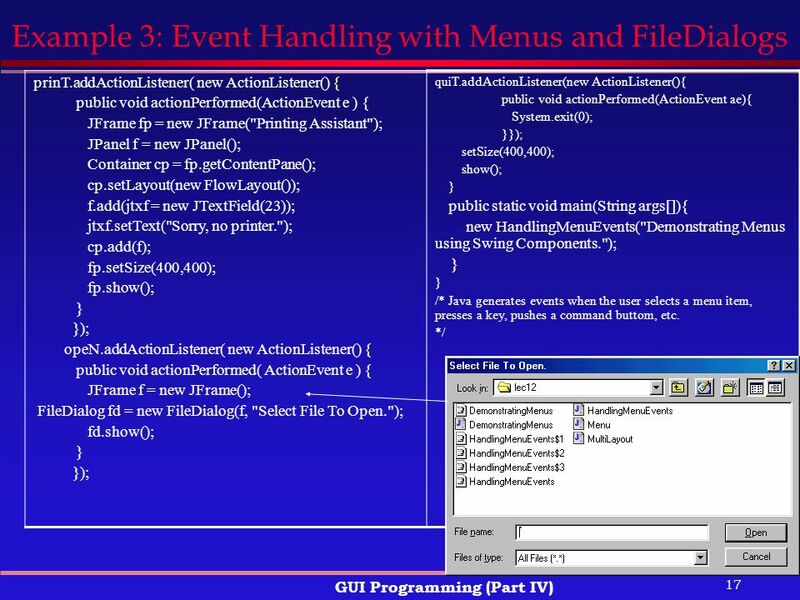 Problem Solving 6 GUIs and Event Handling ICS-201 Introduction to Computing II Semester 071. 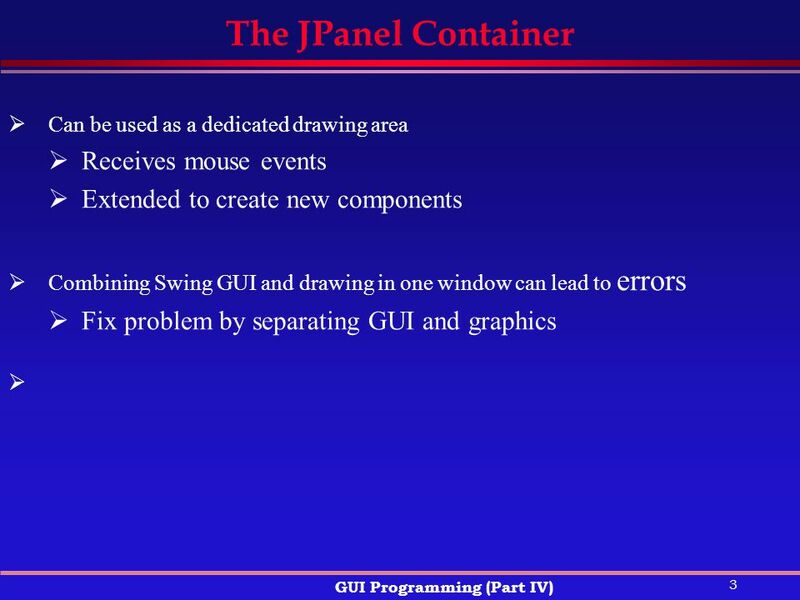 Graphical User Interfaces, 2D Graphics & Game Programming.